That wintery time of year is already upon us. The days are becoming shorter and the nights are bereft of warmth. 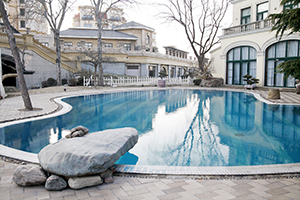 For many people in New Jersey, the changing of the seasons brings the need for swimming pool winterization services. If you’re in need of winter closing services for your pool, Alpa Pools & Spas can help. Our trained crew has been providing swimming pool services to the NJ area for years and are ready to impress you! From seasonal swimming pool maintenance to pool leak detection, we do it all. Winterizing your pool can be very useful for a number of reasons, but many people do not consider all of the factors that benefit such a service. Today, we’ll look at a general overview of what pool winterizing entails and why it’s important to take care of. Every setup is different and requires unique actions, so don’t hesitate to contact us to discuss yours. Taking a sample of your water one week before your scheduled closing will help your experts in determining the right mixture to balance your pool’s levels perfectly. Metal, calcium, and water pH all play big roles in how we configure the right mixtures to smooth everything out. If your pool’s pH is too acidic, the water will start to corrode all involved surfaces. If that water is too alkaline, the resulting inability to hold metals may result in unsightly stains at the bottom of your pool. When the water is happy, everyone can be happy! Upon initiation, a comprehensive pool cleaning service should be in order. Any spots that are missed now can be unsightly landmarks come springtime. Science is a powerful ally for certified service professional, and it dictates that our pool chemicals are more effective when there is less organic material to neutralize. Properly cleaning the pool will be dually efficient in making everything look fantastic when the warm temperatures return. Based on how your pool is being covered, there are a variety of approaches for properly modifying your water levels. Hitting the right depth is helpful because it keeps the H2O from soaking the cover and it prevents unnecessary drainage for the season. While proper pool levels are essential during the busy season, it should also be taken seriously with winterization. At this point, a care package of chemicals are added to the water to prevent any unwanted surprises when preparing for the summer. Fighting algae growth is one big reason for this process. Other processes are also included, including beneficial concoctions such as stain and scale fighters. There are a number of options for this phase, and we will make sure to pick the perfect combination for your pool setup. While pool winterizing can seem like a tiring task, we here at Alpa Pools & Spas believe that it is worth getting done, and getting done right. Swimming pool maintenance is vital for the long-term health and longevity of your investment. If you’re in need of swimming pool services in New Jersey, we can help! Our services also include our comprehensive pool supply store. Contact us today to see how our service can make you and your pool happy!